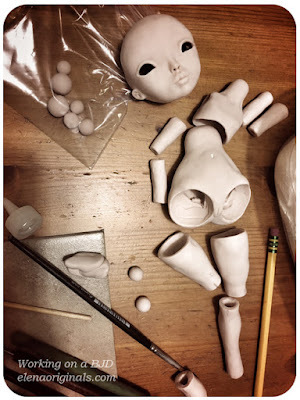 A few years ago I made a BJD doll with air dry clay, but I never finished her, because half way through the project I realized that there are lots of things I would like to change about her, so I stopped. She wasn't what I wanted to continue working on. Just a few short months ago, I decided to build a new one and use both polymer clay and air dry clay. I am working on both dolls at the same time. I find there are a lot of differences between the two mediums, although I am using almost the same approach. I will post my discoveries as I go. Here are the photos so far made with polymer clay. As you can see, there is a long way to go. Here's what I realized so far. 1. The size of the doll I am working on is around 12-12.5 inches tall. I find it is not a very good size for polymer clay, since the arms and wrists become very small. I find that I constantly have to fortify the walls of the polymer clay pieces. Since everything gets "soft" baked at first, clay breaks under the slightest pressure. 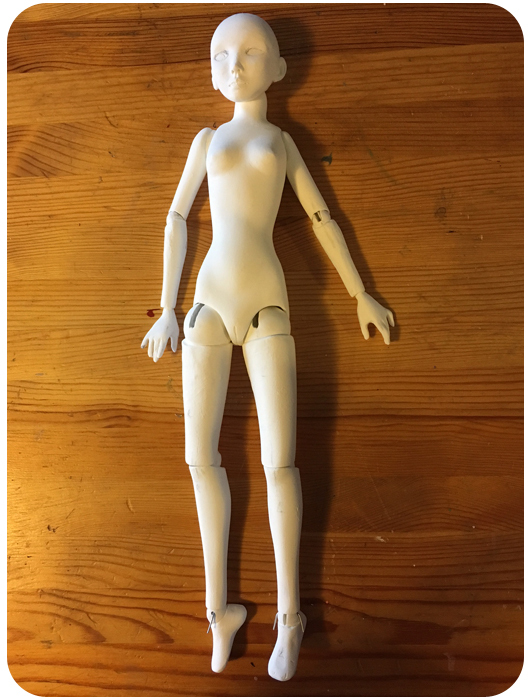 Air dry clay parts (I am using LaDoll) on the contrary is much much stronger. It is much easier to build in stages, using air dry clay, because polymer is very "capricious" medium in this sense. It attracts a lot of dust, so I have to worry about constantly washing my hands and keeping my are extremely clean. The tiniest pieces of dirt get embedded in clay very quickly and it is very difficult to get them out. The only way to get rid of them is actually by scraping them off with a blade, which, of course, create scratch marks, so you have to sand to smooth that. So overall, you do have to sand both - air dry clay (or paperclay) pieces as well as polymer. 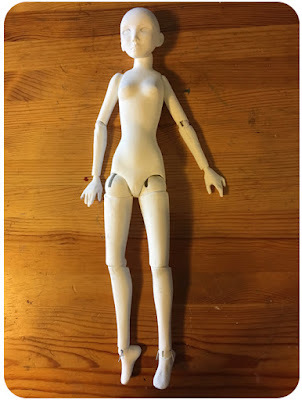 Anyway, what I am trying so say about the size, I think using polymer clay, it is better to build a doll which is around 14 or even 14.5 inches tall, and of course, anything bigger than that. I can't stand to see the doll having thick walls and looking very "crude". After sanding, drilling and polishing the walls become nice and thin, but you do need to have a large piece to work on. There is no problem like that, however, when working with paperclay. 2. Another thing - making the balls. 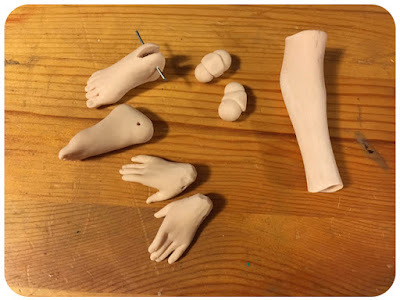 On on hand Polymer clay is a bit more precise, because what you make is what you will use for the doll. There is no shrinking for polymer. Paperclay shrinks slightly and things get slightly warped. However, if you would like to make some corrections to the balls after they have been baked/dried, you can sand paperclay but not so much polymer :) So, here you are. Some things to consider. That's not all, I will keep posting my notes on this. Cheers.